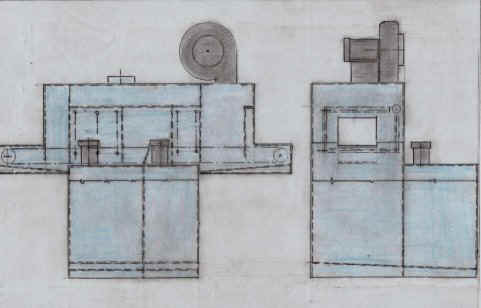 Below are drawings of a cell type conveyor washer. This unit has a reduced footprint which has been found to be preferred in today's manufacturing facilities. There are three stages, wash, rinse, and blow-off. Spray risers and nozzles direct the cleaning and rinse solutions to the part. Electric heat is available as an option for the tanks and blow-off. With heated tanks, an exhaust collar is supplied, however, an exhaust fan can be added for an additional cost. The machine is standard fabricated from mild steel, with stainless steel as an option. This equipment is designed as a low cost alternative to larger and more complicated equipment. Something which should always be considered is the quality of the cleaning and rinsing solutions. In equipment such as this, with small tanks, solutions can sometimes become contaminated quickly. The rinse tank can be skimmed and overflowed, but the wash tank requires something different. As an option, a drum type oil skimmer can be included. This will remove oil based contaminates, and result in a cleaning solution that will require dumping and replacement less often. The maintenance cost of the tanks becomes less, as well as treatment costs of the bad solution. Other options can be made available to customize this equipment in almost any way preferred by the purchaser.